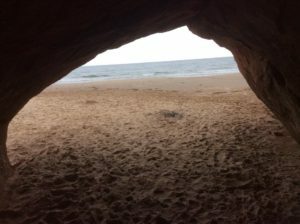 The Magdalen Islands are absolutely gorgeous. Once you visit them, you’ll want to return again and again. The beaches with their powdery golden sand, rival the best in the world and the picturesque landscape will take your breath away. The islands are a paradise for beach lovers, cyclists and kite surfers. 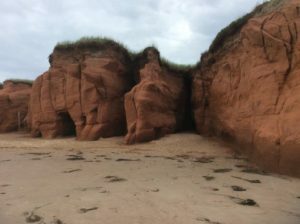 The Magdalen islands are an archipelago of eight islands nestled in the Gulf of St. Laurence, a five-hour boat ride away from the tip of Prince Edward Island. These islands actually belong to the province of Quebec, the French-speaking province of Canada, but are separated from the rest of Quebec by two provinces: New Brunswick and Prince Edward Island. To get to the boat crossing, you will need to travel through New Brunswick, cross the Confederation Bridge over to Prince Edward Island (home of the legendary and loveable heroine, Anne of Green Gables), and then drive from one end of this island province to the other end where you can catch the ferry to the Magdalen Islands. As you approach the islands, you will a red-cliffed island coming up on the left side. This is Isle de l’Entrée (Entry island). The imposing red cliffs give the impression that this island is uninhabited, but as you glide by, you will see it slopes down and you will be able to spot little houses. 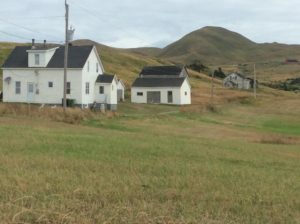 During the year, there are about 100 people (of Scottish and Irish descent) living on the island. When you visit this island and speak to the locals, it is like stepping back in time. The locals speak with a quaint old-style Engish which is difficult to pin down. 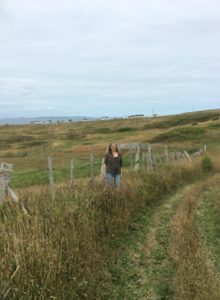 The island is completely rural with no paved roads and you will see cows freely grazing high on the slopes of the cliffs. 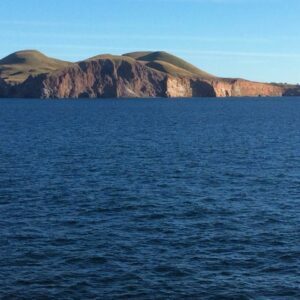 As your ferry nears the docks of Cap-aux-Meules (Grindstone) Island, you will be greeted with a stretch of red cliffs in both directions. This is the most populated of the islands, where most of the business, stores and government facilities are. 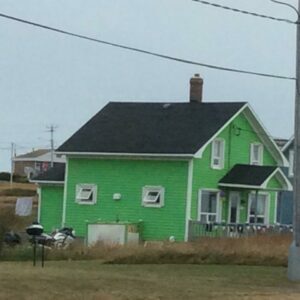 When you get off the boat and begin your visit, you can turn left and drive toward Havre-aux-Maisons Island. 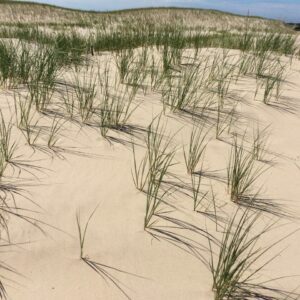 This island boasts a fairly level and rural landscape with very few trees to be seen. Along your way, you will see many colorful, wooden houses which are typical of the islands – splashes of color all over the gently rolling open landscape. 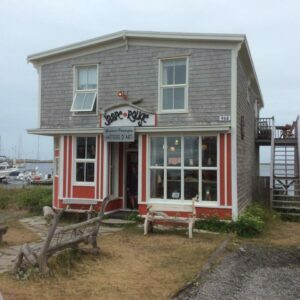 If you go North on Cap-aux Meules island and then head East, you will find your self on the smallest inhabited island of the archipelago; Point-aux-Loups (Wolf Point) Island. 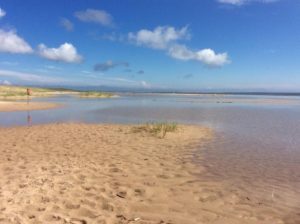 This island is a long and narrow island flanked on both sides by two of the most beautiful sand dune beaches in the archipelago: la Dune du Nord (North Dune) and Point-aux-Loups beach. They are beautiful, but also extremely dangerous during times of high tide and strong winds. Continue along this island East and then head toward the South and you will find yourself on Grosse Isle, an island containing a wildlife reserve and most likely the most beautiful beach of the islands; La Grand Echouerie (The Great Shipwreck), but called “Old Harry” Beach by the English speaking locals. This is the site of the walrus (sea cow) hunts of the 17th and 18th centuries. Going further, but West this time, you will leave Grosse Isle for Ile de la Grande Entréée (The Great Entrance). This Island is Quebec’s lobster capital. 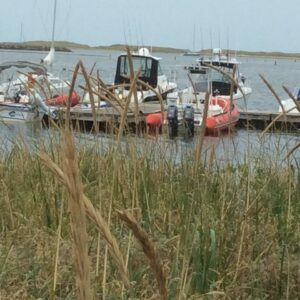 Here you will find marinas filled with colorful fishing boats ready to go out or coming back with a haul. This island is also an excellent place to do kayaking excursions. 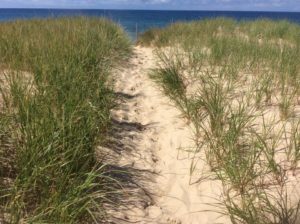 Now, you will need to head back and retrace your steps all the way back to Cap-aux-Meules Island. 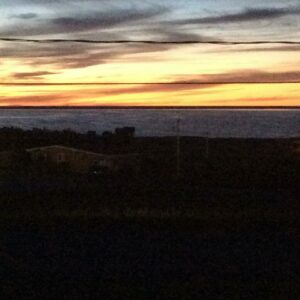 From here you can travel West over to Havre Aubert Island. 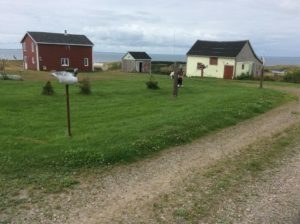 This island, at the western extremity of the archipelagos, is where the first Acadians settled in La Grave (historical site). Here you will drive past colorful beach cottages and fishing boats. You may see kite surfers out in the water. There are quaint little shops, cafés, and restaurants to suit everyone’s taste. Don’t forget to stop in at the Museé de la Mer ( the Museum of the Sea) during your visit. There is one more island – Brion Island –on the most Eastern extremity of the archipelagos. Access to this island is not easy and it is primarily an ecological reserve. 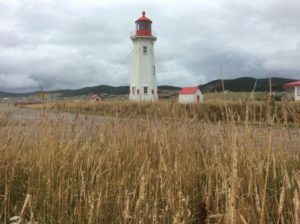 The Magdalen Islands are fiercely and proudly Acadian, for the most part, and all over, on homes and flag poles you will see their flag proudly displayed with its tri-color (red, white and blue) and a gold star. The Acadians have a long history of tears and of strength. As islanders, they also had a history of isolation and battling with the storms of winter and scarcity of food. 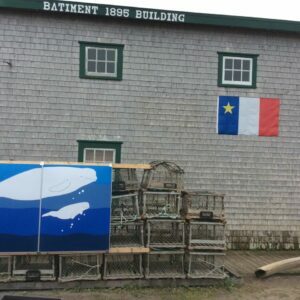 If you happen to be traveling there around August 15th, you will see a proliferation of the Acadian flag since this is Acadia’s National day. Yes, they are a nation without a country, a nation with its own language and dictionary, but no physical country. 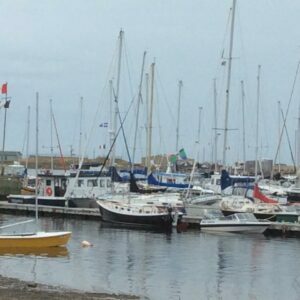 The Magdalen Islands are a haven for water sports enthusiasts. Kayakers and kite surfers are in paradise here. There are constant breezes blowing across the islands, which make them pleasant and challenging for both sports. Bikers will also love the ‘Maggies’ as they are perfect for a good bike ride – hilly, but not overly difficult and long flat stretches as well. There is so much natural beauty to the islands – open spaces, beautiful beaches, high red rock cliffs looking over thunderous waves below. There is the beauty of all the colorful homes and the haunting beauty of the lighthouses seen in various places along the coast. There is something for everyone here. The quiet laid-back rhythm of the islands along with some of the friendliest people you will ever meet will leave you wanting to come back again and again. For seafood lovers, this is a place to stay for a while. For those who want to get away from it all, come here and relax. enjoy the breeze, the waves, the beaches, and the gorgeous sunsets. 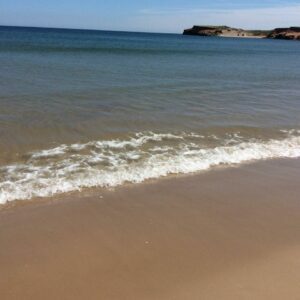 For sports enthusiasts, you will find your niche here whether on land or sea. Listen to the waves and feel the island breeze. Come and listen to a storyteller spin tales of drama out on the ice floats. Be captivated by the fishing stories. Sit down with locals over a beer or a cup of coffee. Climb a hill and enjoy the setting sun over the water. And, when you are back on the ferry taking you away from the islands towards home, you will know and feel that you have left a piece of your heart back on the islands waiting for you to return. Have you enjoyed this post? Leave a comment below.